Shanghai is a big city, and the political boundary that defines the municipality is so big that it extends far beyond the city’s (huge) urban center and deep into the surrounding farmland, subsuming villages and towns that in ancient times led totally separate lives from the county town that would once become China’s largest metropolis. One of these places is Jiading. Today a sleepy little satellite of Shanghai and most famous for the nearby F1 racetrack, Jiading in its heyday was a thriving town of farmers and merchants, surrounded by a moat and city wall that actually were larger than those of Shanghai itself. But for the twist of fate that attracted the European colonialists to the banks of the Huangpu River, China’s largest city might have been taken its name from Jiading rather than Shanghai. Jiading is accessible from Shanghai’s center by subway, and its museums and gardens make it a worthy day trip and escape from both the bustle of downtown as well as the throngs of tourists crowding the nearby ‘water towns’ and other heavily promoted getaways. Jiading’s was once heavily defended by both a moat and a 15-foot brick city wall – necessities to keep sixteenth-century Japanese pirates away, among other threats. Today the moat is still there, but most of the wall has been removed to make way for various modern constructions. A couple of segments remain at the city’s western and southern extremes, though, keeping stately watch over a pair of well-kept moatside parks where residents walk pets, old men go fishing, and families gather for picnics. The town museum indicates that the first walls were built in the early 1200s after the town’s formal founding, and existed in some form for over 700 years, when – as a garrulous retiree told me while I took photos – the authorities pulled most of the walls down in the 1950s to make room for an official meeting and activity center, among other things. 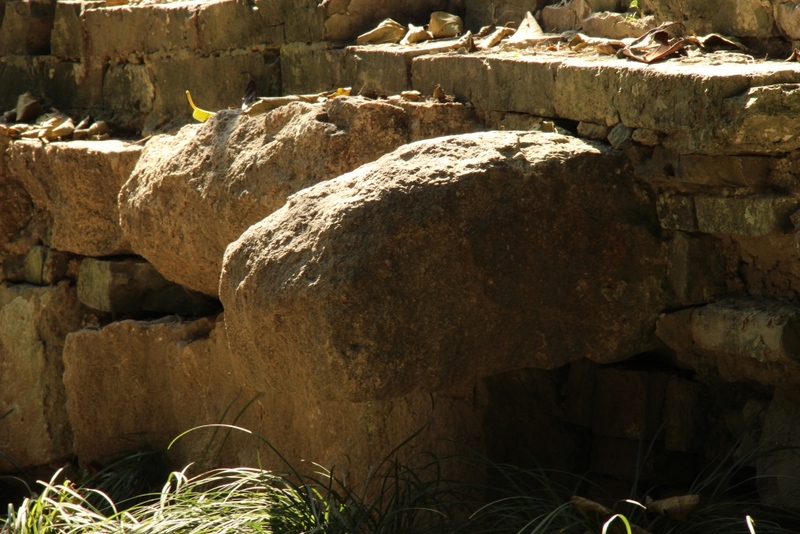 Parts of the wall have been restored to an ancient appearance, but walking off the beaten path in the parks can provide views of the wall in various states of disrepair, patina intact. 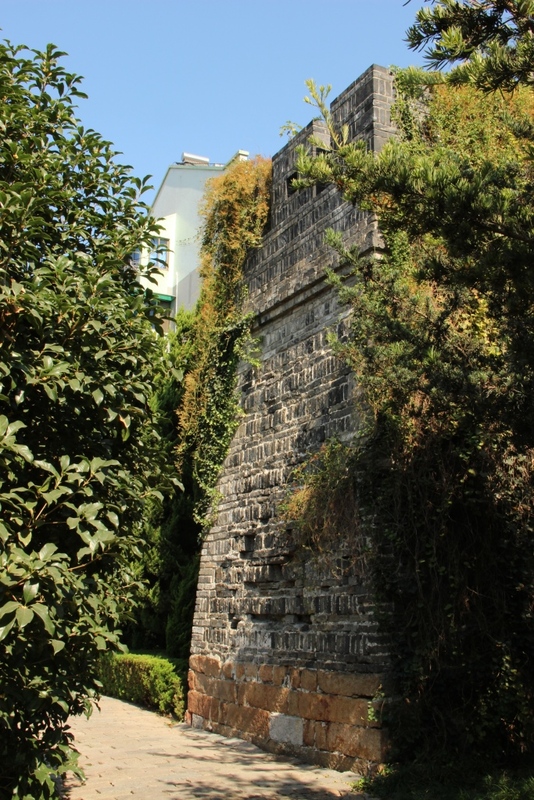 City wall in background, overgrown with ivy and trees. Within the moat and city wall, most of Jiading’s attractions are concentrated in the center of town. 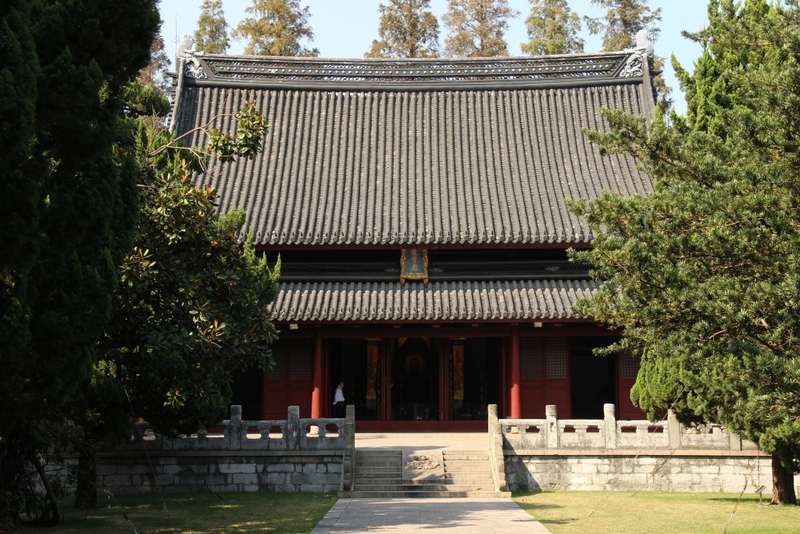 One of the best is the Imperial Examination Museum, which is housed in the leafy grounds of Jiading’s Confucius Temple. The temple itself dates from the late Song dynasty and is considered one of the best-preserved Confucius temples in the lower reaches of the Yangtze River Delta. 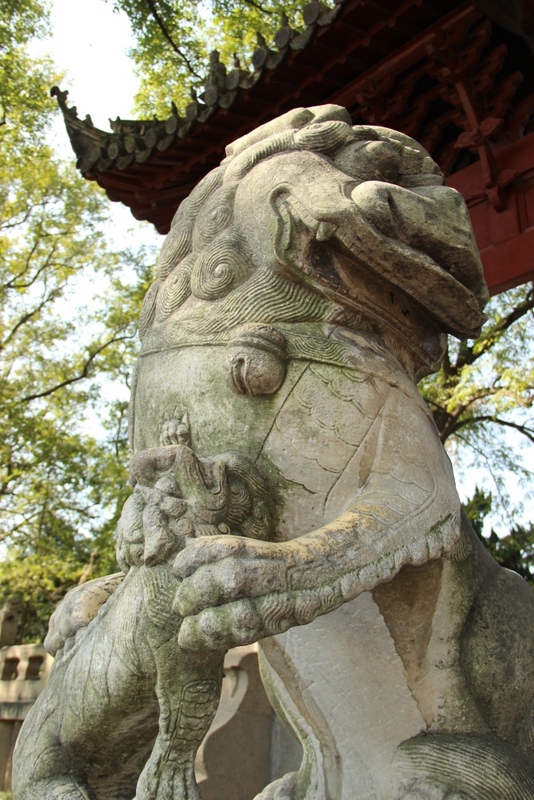 The temple is fronted by a pleasant pond and garden that is littered with relics of an older time, including partially dismantled turtle statues and a pair of stone lions guarding the temple’s entrance gate. Ancient civil service exams may sound like an esoteric topic for a museum, but one needs only consider the long shadow that the SAT casts over the lives of American families – or that the national gaokao college entrance exam casts over Chinese ones – to appreciate that the exams are more than a series of tests. They were a wrenching trial that passed judgment over years (even decades) of training, gating access to the comforts, prestige, and responsibilities of official life and in the process burdening candidates with the future of not just themselves but their extended families. An entire culture of study and aspiration evolved around the exams, to the extent that many ancient Chinese folktales’ version of ‘happily ever after’ involved protagonists (or their children) passing the the national exams and becoming high-level officials. The Imperial Examination Museum is spread over five halls, tracing the exam system’s roots back to the Tang dynasty. 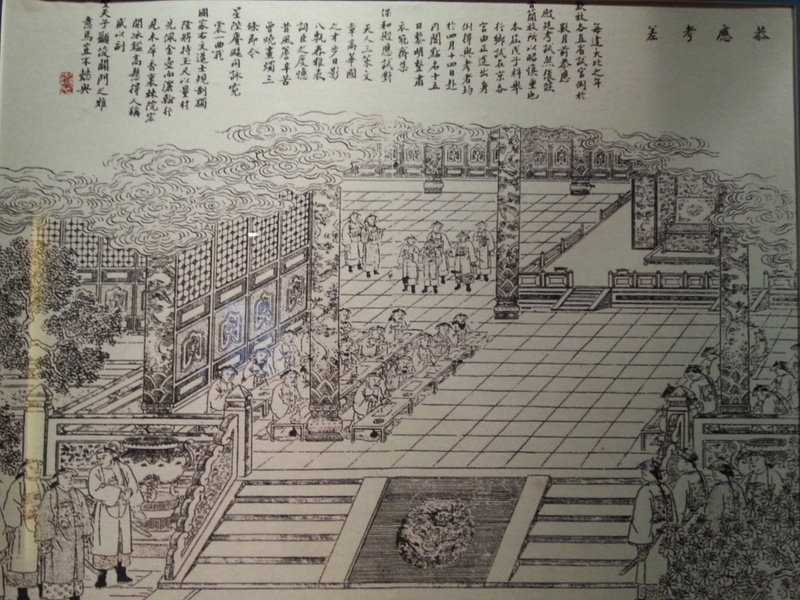 The museum is not shy about touting the exams as an admirable early form of meritocracy (a section is dedicated to how the exams influenced civil service corps in lands as far afield as England), but as nearer modern times in the Ming and Qing dynasties it also does not hesitate to argue that the exam’s rigid structure and content played a role in strangling creativity and adaptability out of China’s elite classes, leaving the empire vulnerable to Western invasions. The system was abolished in 1905, part a series of reforms that were too little, too late to save the tottering Qing empire. A hall dedicated to biographies of some of the most successful candidates details one named Zhang Jian, who in 1894 was among the last to pass at the highest level – the fall of the empire in 1911 was hard on much of the newly-redundant imperial bureaucracy, but Mr. Zhang’s talents apparently extended well beyond memorizing the Confucian Classics, such that he was able to transition to being a successful industrialist as well. Much of the museum uses illustrations and surviving testing materials to show the culture of studying for and taking the exams. There are byzantine flow charts of the examination system’s multiple tiers of tests, designed to weed out candidates as they climbed from humble local exams to the national-level tests in the imperial capital. The picture below depicts one unlucky candidate who, having failed the lowest level exams on multiple attempts, finally passed at the age of 60 and promptly died of excitement. (The English signage in the museum is generally good, if a little sparse – the accompanying sign for this image eschews a full translation of the Chinese explanation to simply say “Take exams to death.”). The sheer scale of the exams is on full display in models of sprawling testing centers, which provided testing chambers for up to 20,000 candidates. The chambers themselves (shown in scale models) were really just small cells, containing a pair of boards that could be shifted up and down to serve as a desk and chair or a hard bed. Tests could last for days and candidates were expected to bring their own food as their little cell became the only world they knew. Perhaps the most interesting section of the museum is the one dedicated to the ingenious methods that unscrupulous candidates used to cheat – all the more interesting in light of recent issues with cheating on the SAT in China, as well as China’s cat-and-mouse game with cheaters in its domestic college entrance exams. Trying to sneak in well-studied substitutes to take the exams in one’s place was just a big a problem in ancient times as it is now, but such test-takers-for-hire today are less likely to be sentenced to wear heavy wooden boards around their necks. Throughout history, the focus of the exams was on memorizing and reproducing passages from the Confucian classics. The tests were firmly closed book, but that didn’t stop hopefuls from trying to sneak in their own copies. Bound editions presumably were easily picked up in body checks at the front gate, which is why the museum has such a marvelous collection of Confucius’ wisdom inked in tiny print on less obvious materials. 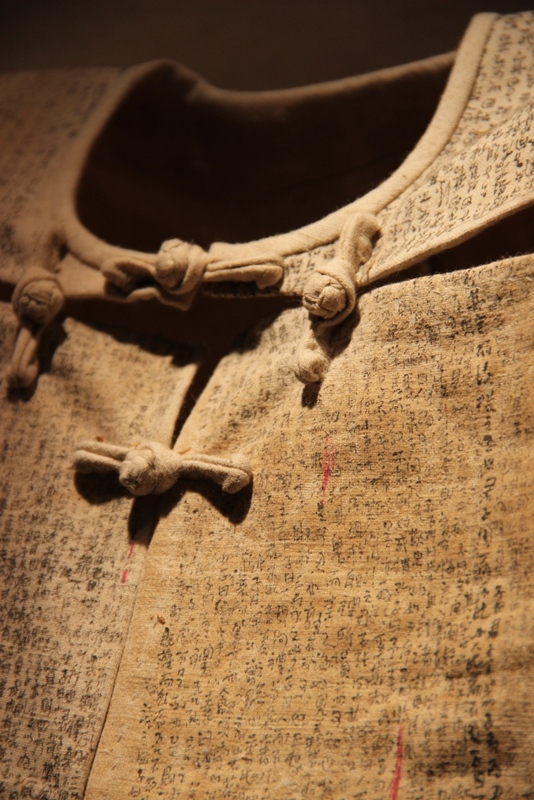 Tiny characters written on strips of silk could be tucked into ones clothes or hidden in steamed buns that candidates brought from home. The scene-stealer is a cloth undershirt shirt whose every square inch is covered with characters so small they are barely legible. I overheard a tour guide claiming the shirt had over 90,000 characters in total. Admirable though the effort was, it seems unlikely that guards would have missed a candidate filling out his exam papers while closely scrutinizing his own underwear – which is maybe how the shirt ended up in official hands for display. 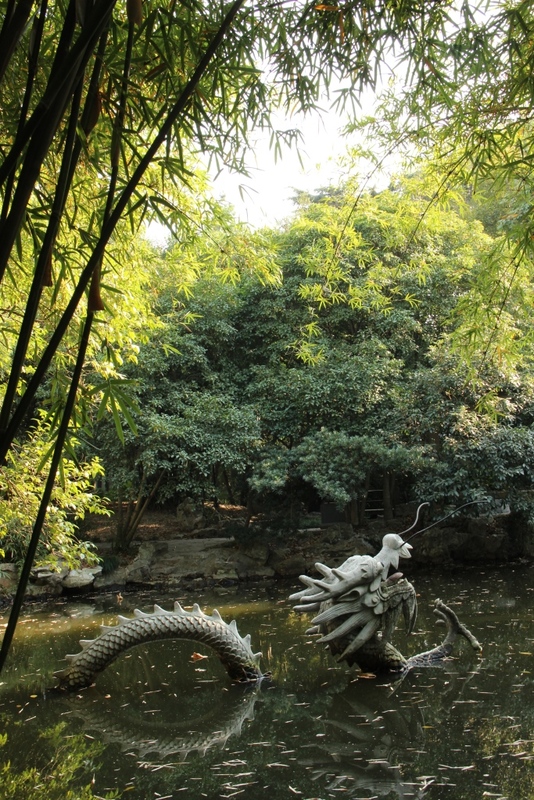 Next to the Confucius Temple is Huilongtan Park, which dates from the Ming Dynasty and who’s central pond is fed by several streams that appear like a group of gathering dragons (modern visitors’ imaginations may vary). The park’s shaded walkways and open lawns attract many families for weekend recreation. 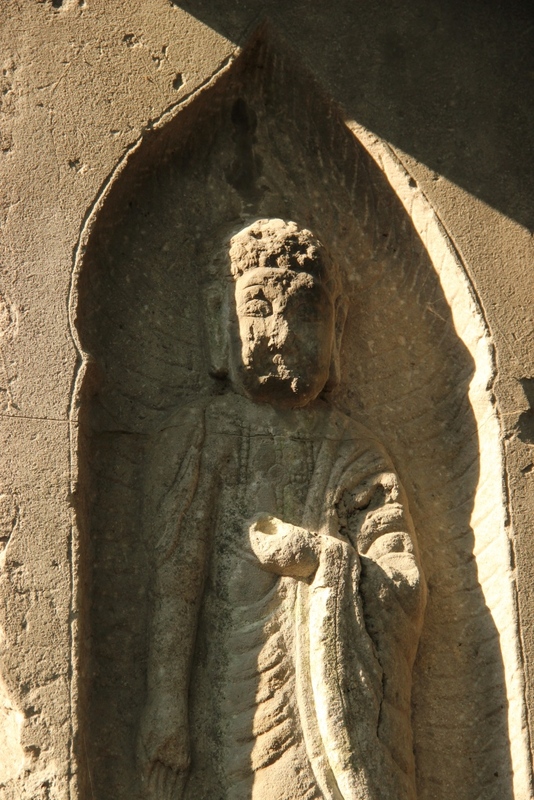 The park also is sprinkled with a number of old statues and pavilions, including this Song-era Buddha carving. North of the Confucius Temple and Huilongtan Park is the center of town, marked by the convergence of the two rivers that run east-west and north-south through the city. This designated ‘Old Street’ neighborhood comes closest to capturing the vibe of nearby ancient ‘water towns’, with canals running past white-walled buildings with black-tiled roofs and window trimmings. Students from the nearby branch of Shanghai University crowd the area’s shops and snack stands on weekends. 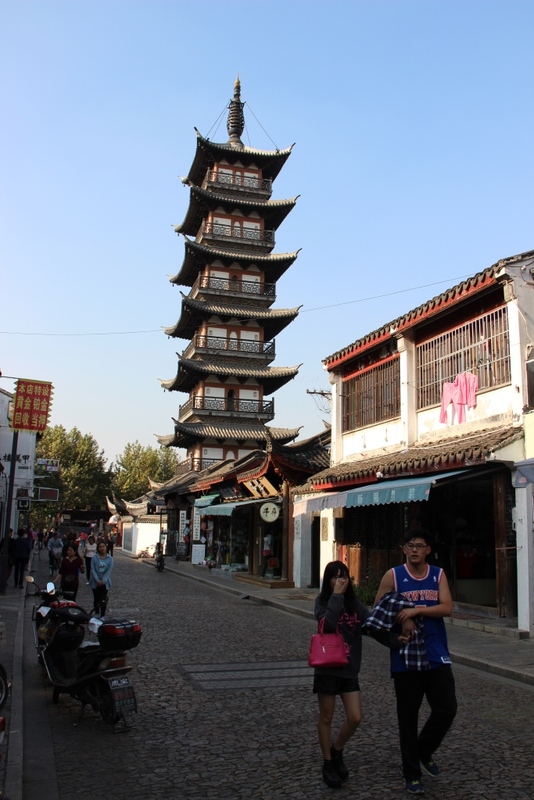 Overlooking the whole neighborhood is the Fahua Pagoda, which dates from the early 1200s but has been rebuilt and restored many times since then. You can pay to climb the pagoda and take in views of town. The pagoda grounds also house a small exhibition on Gu Weijun, one of modern China’s most famous early diplomats and a Jiading native. Better known as Wellington Koo in the west, he made an eloquent and impassioned effort to reclaim parts of Chinese territory from Germany in the Paris peace talks in 1919, only to see the great Western powers hand Germany’s Chinese colonies to Japan instead. A short walk west of Fahua Pagoda is the Jiading Museum, which is impressive for a city of Jiading’s size. 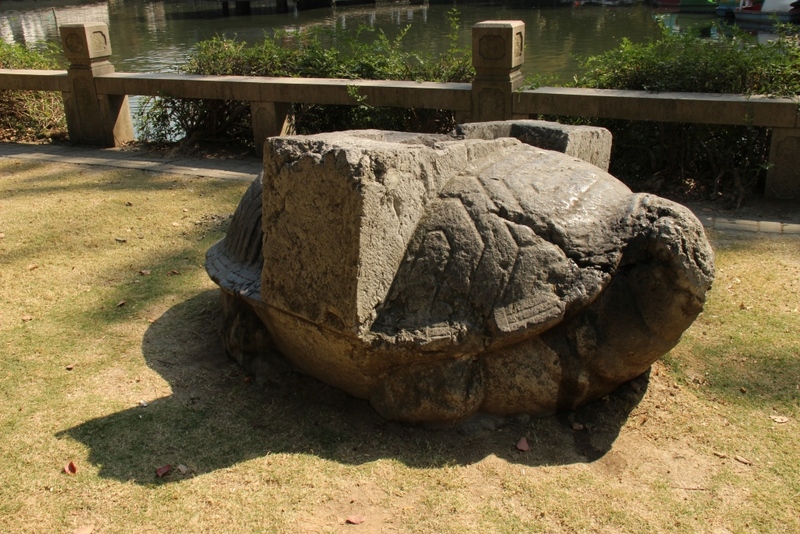 Basically a museum of local history, the museum’s exhibits trace Jiading’s ancient origins to its official designation as a town in the late Song dynasty – shortly after the imperial capital relocated to nearby Hangzhou. After then the town flourished as a center of grain and cotton production, and Jiading’s cotton and textiles were exported throughout the empire. 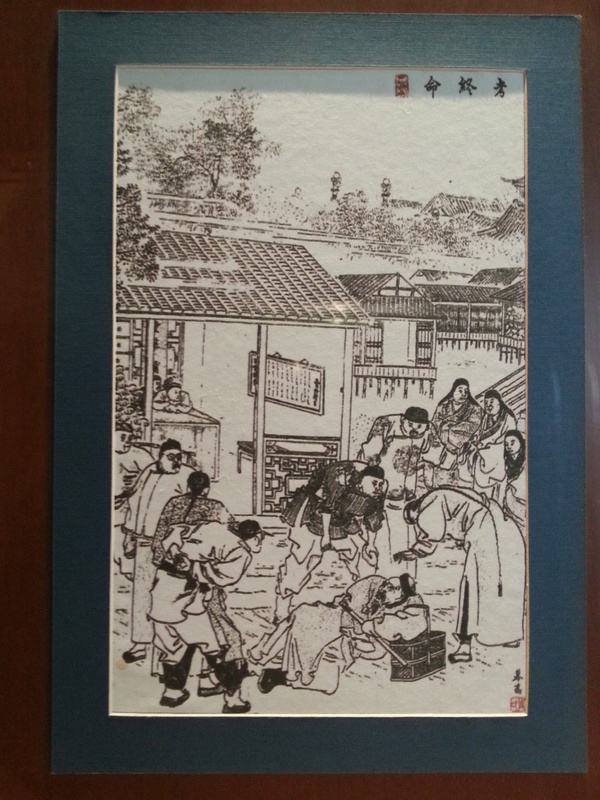 Also on display are Jiading’s many encounters with coastal invasions, including by Japanese pirates attacking the old city walls in the sixteenth century, and again by the Japanese Imperial Army in its attack on Shanghai in 1937. A number of artifacts and artworks are on display, including many exhumed from the ancient tombs of local worthies. The museum concludes with a few exhibits on modern Jiading’s sidelining as a comfortable satellite of much Shanghai, itself once a small town who’s city wall was actually smaller than Jiading’s. 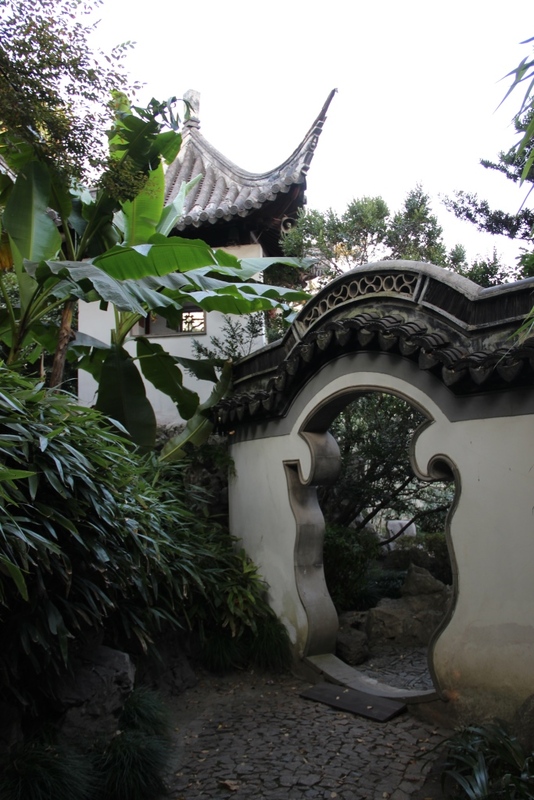 Just west of the Jiading Museum is the Qiuxia Garden, a well-preserved example of Yangtze River Delta garden design dating from the late fifteenth century. 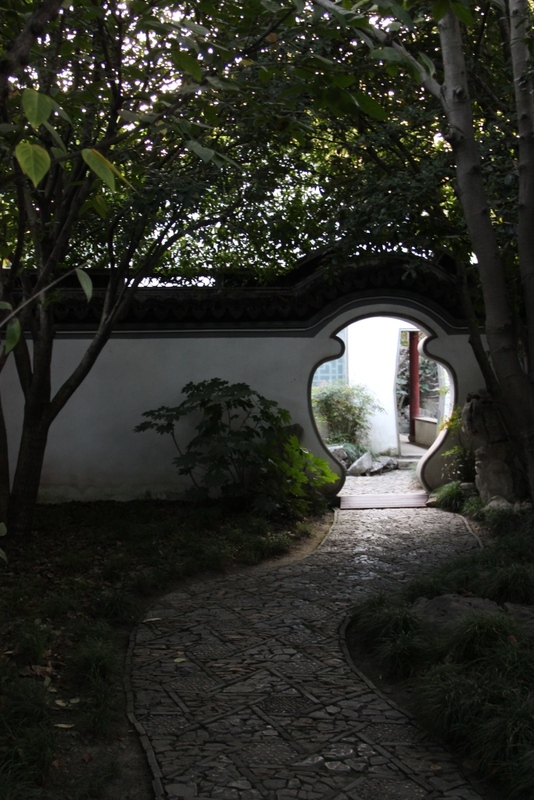 Nearby Suzhou may be more famous for its concentration of old Chinese gardens, but Qiuxia Garden more than holds its own with its ponds, rockeries, pavilions, secluded walking paths, and assortment of well-designed angles for taking in the scenery. 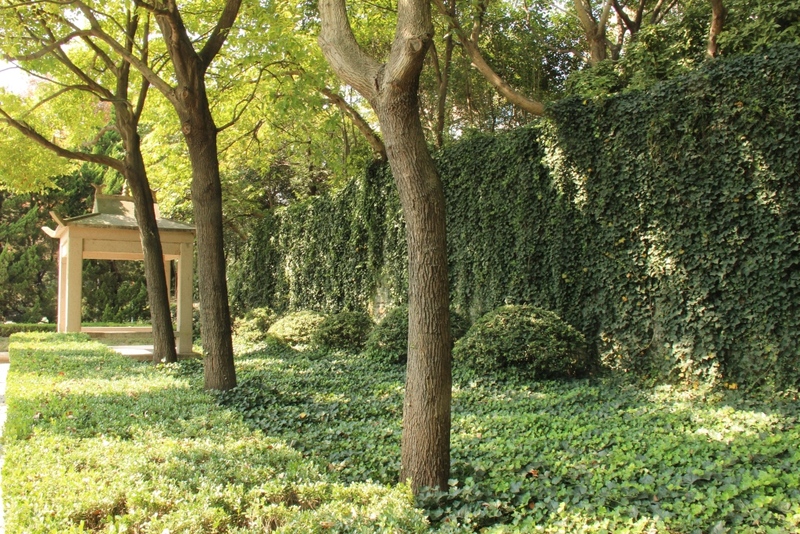 Given that Jiading’s gardens lack the tourist attraction status of those in Suzhou, a major plus is that Qiuxia is relatively free of crowds even on weekends, allowing visitors to take in the grounds at the leisure, and maybe even imagine they have the place to themselves, just as the old elites who built the place imagined it.